Space Shuttle Endeavour Route and Conflict Mapping | David Evans and Associates, Inc. The Space Shuttle Endeavour has a new home in the City of Los Angeles, but getting there was no small feat. The shuttle traveled the streets of Los Angeles from Los Angeles International Airport to its final resting place, the California Science Center in Exposition Park. DEA employed 3D mobile laser scanning technology to collect data and identify obstacles along the 15-mile route. Endeavour is 122 feet long, with a wingspan of 78 feet and a height of 58 feet, and weighs 175,000 pounds. For the shuttle to move safely and successfully through the urban center of Los Angeles, DEA’s survey team used laser scanning technology to identify horizontal and vertical conflicts that would need to be avoided or temporarily removed along the proposed route. DEA’s 3D mobile laser scanning system provided a dense point cloud of data about the route in August of 2011. A video was also produced to show the conflicts and obstructions. 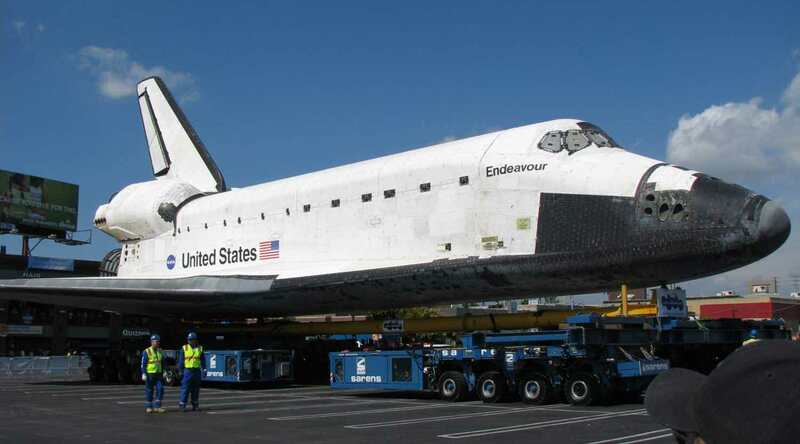 In October of 2012, the shuttle moved successfully and without incident through the streets of Los Angeles, an event captured on national television.